Impingement results either because the femoral head is not quite spherical or because the acetabulum is too deep; thus when the hip is flexed fully the neck of the femur is pushed against the labrum and acetabulum at the front of the hip, causing damage to these structures. 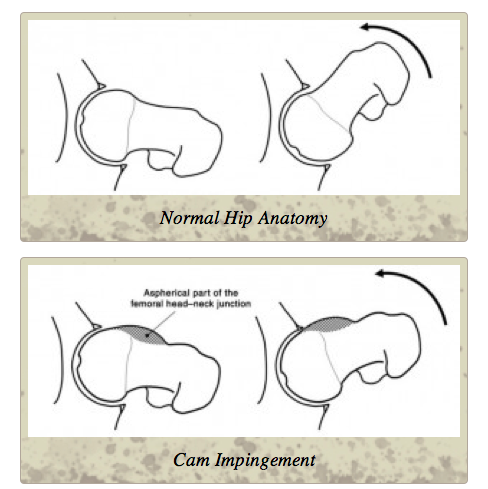 CAM impingement occurs when the femoral head is not spherical. 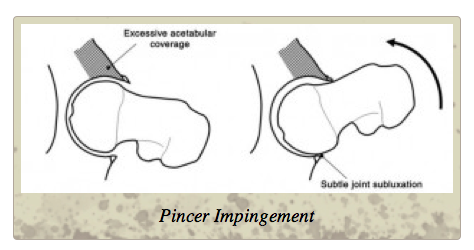 PINCER impingement occurs due to an excess of growth of the upper lip of the acetabular cup. If both types of impingement are present it is termed MIXED impingement. 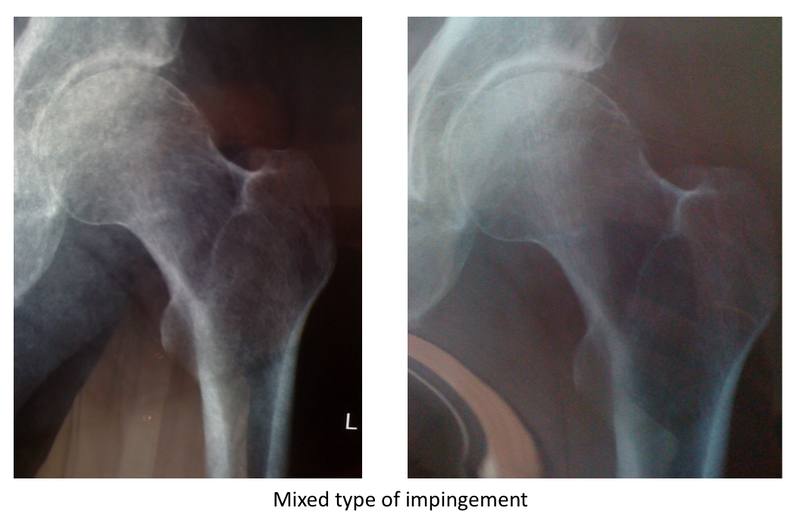 Anterior femoroacetabular impingement usually presents in young athletic patients less than 50 years old and involved in activities that require repetitive hip flexion. These patients frequently complain of hip discomfort with sitting and hip flexion activities. The location of the discomfort is predominantly in the groin (anterior inguinal), but can be associated with buttock and lower lumbar discomfort. Anterior femoroacetabular impingement is consistently associated with anterior labral pathology. Therefore, patients may complain of mechanical symptoms (locking, catching, and giving way) indicative of labral tears or articular cartilage delamination lesions. Patients with more severe deformity may also complain of restricted hip motion, specifically limited hip flexion and limited internal rotation in flexion. On physical examination, the patient’s gait is either normal or slight limp will be present occasionally. A Trendelenburg’s test may be positive, especially if the disease is more established. Abductor strength is routinely assessed and commonly reveals slight weakness. Hip motion should be evaluated very carefully. A restriction of hip flexion and hip internal rotation is quite common. Many of these patients have hip flexion limited to 90-100 degrees (normally 120-130 degrees). Internal rotation in 90 degrees of flexion is quite restricted and is usually between 0 and 10 degrees. This restricted internal rotation in hip flexion is due to osseous impingement of the anterolateral femoral head-neck junction with the acetabulum. The anterior impingement test is almost universally positive and should reproduce the symptom of groin pain. Therapeutic management comprises acetabulo- and femoral osteochondroplasty, which may be administered by open or minimally invasive open surgery as well as arthroscopically. 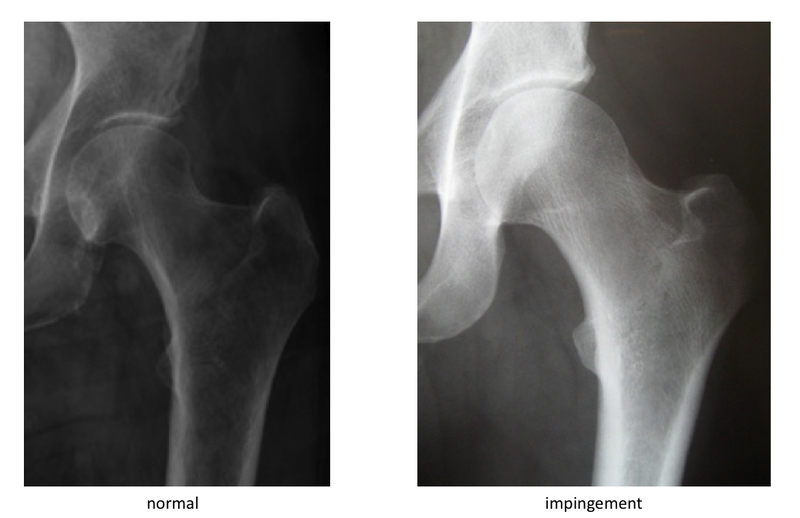 In certain cases impingement pathology has to be addressed by acetabular reorientation (e.g. osteotomy). Published data show that timely diagnosis and treatment is pivotal for therapeutic success.